You know there's going to be trouble when you see the headline of the article on eSchoolNews-- "Taking personalized learning to scale." But then, this is a business that regularly uses the oxymoron "mass customization" without irony. Enjoy our new personalized seating. Resources can be distributed to individual students using digital tools so that students experience content that is relevant to their goals and interests. So there's the picture. Personalized [sic] education delivered by computer, padded in bureaucratic blather, and-- well, somehow the individual student will follow her own educational muse through instruction geared to here by the computer algorithm, so that she can enjoy a personalized learning experience as long as she has her eyes and her hands exactly where we want them. If you find personalized [sic] learning kind of creep and unappealing, this may be what you're reacting to-- the notion that we deliver instruction geared to an individual student not because that will allow that student to grow and learn and develop into her own best self in her own best way, but because by delivering a "personalized" lesson, we can better get the student to do exactly what we want her to. The Personalized [sic] Learning that we're being pitched isn't about reconfiguring the whole educational experience to be centered around the individual student, but another tool to get students to behave like good little widgets in a technocratic edu-system. This is not personalization aimed at better serving the student; it's personalization as a tool to get the student to better serve the system. 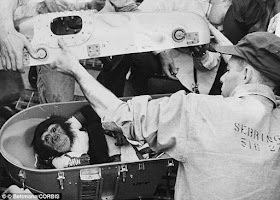 "If we customize the seats and the restraints, then maybe the monkeys won't fight back so much when we strap them into the capsule and send them into orbit." Here's what I always wonder, when I read crapola like 'content that is relevant to their goals and interests:' Who is going to suggest or initiate a relationship to this 'content?' Who is going to plant seeds that might, maybe, lead to Average Kid being interested in something, let alone passionate about that something? Where DO those nascent interests and goals and curiousities and questions and pushes toward skills and knowledge come from?